One way in which a person can pass on money held in bank accounts or brokerage accounts to his heirs is through the use of Totten trusts, also referred to as payable upon death accounts. A Totten trust is created when a person who owns a bank account names a beneficiary who will receive the money in the account after the death of the bank account owner. This is usually done by setting up the account “in trust for” the beneficiary, although different financial institutions may have differing requirements as to what language should be included in order to create a Totten trust. There is no document that needs to be filed with a court to create a Totten trust; the trust is created by submitting paperwork to the financial institution. Totten trusts are revocable, which means that the beneficiary can be changed at any time while the bank account owner is still alive. However, the named beneficiary gets no rights to the funds in the bank account until the death of the bank owner. In some cases, the beneficiary may not even know about the account’s existence until the owner’s death, and the beneficiary cannot challenge the owner’s decision to close an account and withdraw all the money, thereby revoking the Totten trust. This is what generally makes a Totten trust a better avenue to leave the money in a bank account to a beneficiary than joint ownership of the bank account. With a jointly owned bank account, the joint owners have equal rights to the funds in the account and can withdraw the funds without getting each other’s permission. The beneficiary also gains immediate access to the money in the bank account and can use it all without consulting the original bank owner. It is also more difficult to remove a joint owner from a bank account than changing the beneficiary of a Totten trust. Another advantage of a Totten trust is that it transfers the money in the account to the beneficiary outside the deceased’s estate. The Totten trust does not go through probate, and if there is any disagreement as to the deceased’s will that leads to litigation, it would not affect the named beneficiary’s right to receive the money in a Totten trust. It is important to note that spouses can reach the money held in a Totten trust for the purpose of exercising a spousal elective share under New York law. Therefore, Totten trusts cannot really be used to disinherit a spouse. If the beneficiary of a Totten trust predeceases the account owner, and the account owner does not make the necessary changes to name a new beneficiary, the gift of the funds in the account would lapse. The funds would then have to be distributed in accordance with the terms of the account owner’s will. If there is no will, the funds can be distributed according to New York’s intestacy law. 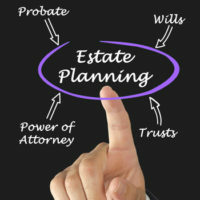 For more information on how to pass on assets to heirs using trusts, contact a knowledgeable trusts attorney at Meyer & Spencer, P.C., an estate planning firm with offices in Pleasantville and Mahopac, New York, serving Westchester and Putnam Counties.